Fire Tube Industrial Boiler Market size was valued over USD 2 billion in 2017 and annual installation is anticipated to exceed 40 thousand units by 2024. Rapidly growing food processing industry and positive outlook toward chemical sector along with growing population is set to drive the fire tube industrial boiler market size. For instance, as per Indian Brand Equity Foundation (IBEF), food processing industry accounted for over USD 250 billion in 2015 and is projected to reach over USD 480 billion by 2020. Furthermore, global financial institutions along with respective governments have introduced policies and initiatives in favor to develop new industrial centers which in turn will fuel the product deployment. Ongoing global efforts toward reduction of GHG emissions in conjunction with shifting trends toward upgrade and replacement of existing heating units will boost the fire tube industrial boiler market growth. Stringent environmental norms and regulations along with rising fuel prices and increasing maintenance cost will further stimulate the substitution of conventional heating units with energy efficient systems. Condensing fire tube industrial boiler market in 2017, was valued for over USD 700 million. Ability of these boilers to deliver lower carbon emissions, higher energy efficiency and reduced operational cost are the prime factors which will strengthen their adoption preferable over the alternatives. Furthermore, ongoing government efforts toward promotion of energy efficient heating units and replacement of conventional heating systems will positively influence the industry growth. Low initial investment, ease of installation and product’s ability to attain higher temperatures are some of the paramount factors which will drive the non-condensing fire tube industrial boiler market size. Capability to perform under extreme weather conditions coupled with its compact design will further enhance the product adoption. Natural gas fired fire tube industrial boiler market in 2017, was valued over USD 600 million. Clean combustion and accessibility to fuel along with government norms and legislative mandates to reduce greenhouse gas emissions will augment the industry growth. For instance, the U.S. Environmental Protection Agency (EPA) has introduced two emission rules for boilers, Boiler Major Source Rule (BMACT) and Boiler Area Source Rule in order to limit toxic air pollutants efficiently from large as well as small scale boilers. Oil fired industrial boiler market will witness growth of over 2% by 2024. Competitive fuel prices and low installation cost of the product are some of the major factors that will favor the industry expansion. However, lower energy efficiency, long term price volatility and safety concerns may hamper the industry growth. 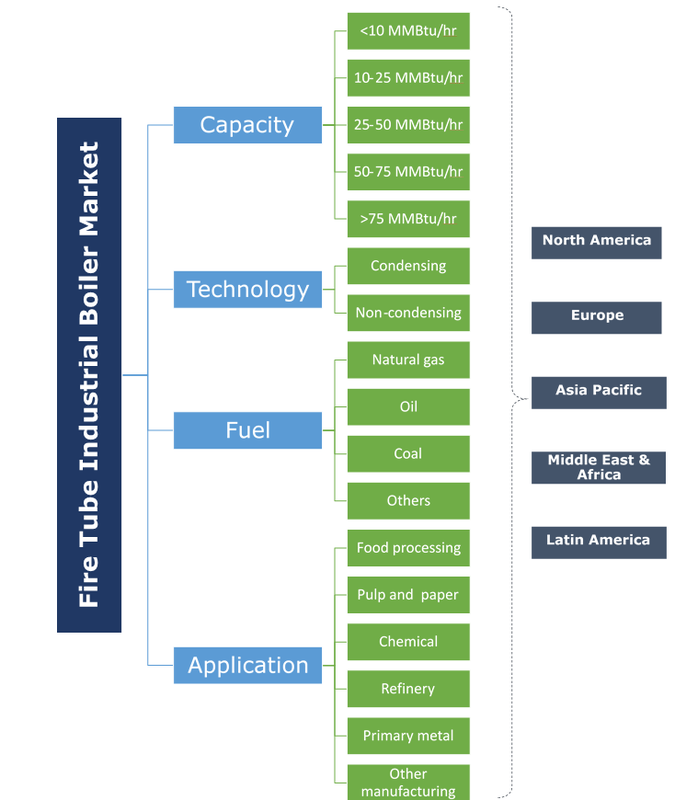 Growing proclivity toward processed & packaged food accompanied by rising investments toward new capacity development and expansion of food processing industry will boost the fire tube industrial boiler market growth. In 2017, Snyder’s Lance announced investments worth USD 7 billion toward capacity expansion of its facility in Berkley. Chemical in 2017, accounted for over 25% revenue share of fire tube industrial boiler market. Rising demand for commodity chemicals, fine chemicals, cosmetics and petroleum products will propel the industry growth. For instance, in 2017 the value of chemical products consumed by China was accounted to be over USD 1,500 billion, followed by the U.S. at USD 510 billion. Resurgent economic growth along with supportive government policies has resulted in rapid expansion of small-scale industries which in turn will fuel the <10 MMBtu/hr industrial boiler market growth. Shifting trends toward multiple boiler systems coupled with positive outlook toward primary metal business will further foster the product deployment. 10-25 MMBtu/hr boilers in 2017, accounted for over 12% of the fire tube industrial boiler market share in terms of revenue. Ongoing investments toward replacement and upgrade of traditional steam generating systems along with wide application range of the product across metal, food processing and chemical industries will complement the business outlook. The U.S. fire tube industrial boiler market is anticipated to witness growth of over 2% by 2024. Favorable federal regulations, burgeoning economy along with growing investments toward modernization & expansion of industrial facilities will drive the industry growth. Growing chemical and petrochemical industries across the country will further propel the product adoption. According to the U.S. Department of Commerce, in 2017 the FDI inflow toward chemical industry surpassed USD 700 billion across the country. Asia Pacific fire tube industrial boiler market will witness robust growth on account of growing consumer market, improving regional integration and sizeable investments. Growing efforts by respective governments toward development and strengthening of industrial sectors across growing economies will further augment the business growth. Prominent companies active in the business are primarily focusing toward the development of new and innovative products and inorganic & organic growth ventures as part of their growth strategy. For instance, in March 2016, Cleaver-Brooks introduced a complete line of containerized and skid-mounted portable fire tube boiler units. The product launch strengthened the product spectrum of the company in portable fire tube boiler systems. Fire tube industrial boilers include a water-storing container and single or multiple tubes containing hot gases from furnace running through the container. These are primarily deployed for steam and hot water production for numerous applications across various industries including food processing, chemical manufacturing, pulp & paper and metal manufacturing among others.